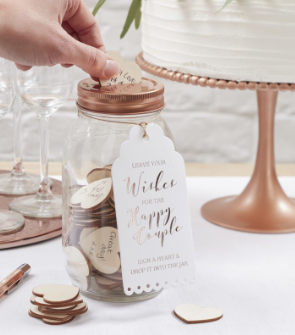 Use this simply stunning Wishing Jar as an alternative guestbook at your wedding. 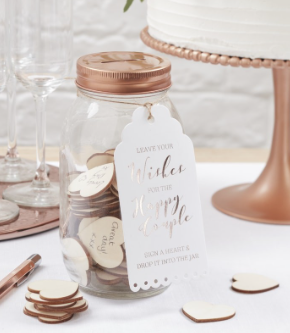 The gorgeous glass jar comes with a romantic rose gold lid, with slot and 100 wooden hearts. 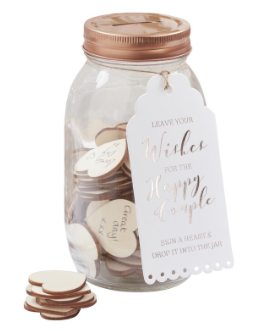 Your guests can write their special wishes to the bride and groom onto the blank hearts and slot them into the jar. Cherish your magical memories for years to come. Each pack contains 1 wishing jar, 100 wooden hearts and 1 instructions tent card. Wishing Jar measures: 9cm (W) x 17cm (H). Wooden Hearts Measure: 4cm (W) x 3.5cm (H). Tag measures: 6.7cm (W) x 13cm (H).